The 2018 China Top 500 Enterprises Summit Forum was held On September 1st and 2nd. China Top 500 Enterprise Development Report (2018) was released. Weihua Group is listed again in the Top 500 list, which has been in this list for 4 consecutive years since 2015. The list of China's top 500 companies is based on the international common practice of the China Enterprise Confederation, which is ranked by the company's operating income in 2017. 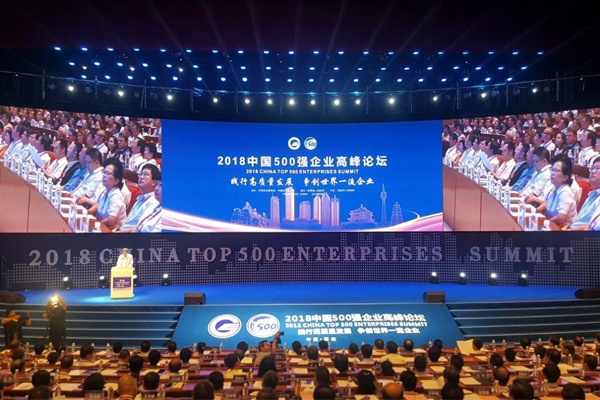 The China Top 500 Enterprises Development Report (2018) shows that the growth rate of China's top 500 manufacturing enterprises in the 2018 is higher than the service industry's top 500 enterprises by 2.93 percentage points, reversing the increase of the top 500 service companies for five consecutive years. In 2018, the growth rate of China's top 500 manufacturing enterprises was 7.10% higher than that of China's service industry. The improvement of the profitability of manufacturing enterprises was better than that of service companies. This achievement of Weihua Group is closely related to the continuous pursuit of excellence in the transformation and upgrading of enterprises. As the leading crane manufacturer in China, Weihua Group always adheres to the philosophy of successfully built in good faith and strives for ultimate return. It shoulders the mission of creating the international brand of Weihua and promoting the national industry of China, constantly strengthening its own reform and persisting in innovation drive, vigorously develop international trade, actively transform and upgrade to the general contractor, provide reliable products to customers with advanced technology research and development, strict quality control and sophisticated manufacturing equipment, and win market recognition with credit management and excellent products. Weihua has made outstanding contributions to the economy growth.